You’d never guess that some of NYC’s best, most innovative pork short ribs can be found at an Israeli restaurant. Green Fig is full of bold variations on Israeli flavors, straying far from kosher guidelines. Tel-Aviv born Chef Gabriel Israel came to New York City just over two years ago to attend the Culinary Institute of America in Hyde Park, NY. He instead opened up Shuka, a successful food truck in Manhattan serving three variations of this North African dish. Israel recently moved on to become chef de cuisine at Green Fig, bringing a focus on modern Israeli cuisine, with influences from North Africa’s Maghreb region, the Middle East, and Southern Europe, to the top floor of the Yotel Hotel. The “jaffa to tijuana,” for example, is pork belly cooked with traditional Middle Eastern flavors like pomegranate juice, coriander, cinnamon, fresh oregano, star anise, served on Gabriel’s house-made take on a Jerusalem bagel, which is lighter, thinner and more oval-shaped than it’s American counterpart. You’ll also see pork in “the not kosher bbq,” which, according to metro.us, is one of the menu’s most surprising dishes. The pork short ribs are dry rubbed with zhug, a Yemenite hot sauce with cilantro and parsley. The barbecue sauce is just as creative, comprised of mustard, ketchup, vinegar, and Asian elements like sesame seed oil and soy sauce. It’s plated with labane, za’atar, and kohlrabi for a true Israeli twist. 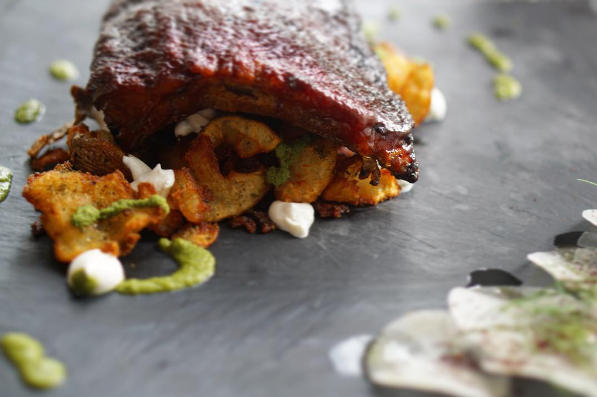 Dripping with flavor that spans continents and flavor profiles, these ribs are unlike anything we’ve seen before. Gabriel Israel isn’t alone when it comes to talented Jewish chefs and foodies who dabble in pork and shellfish–Time Inc.’s first ever bacon critic is Jewish (who happily eats bacon), and Brooklyn is home to more than one treyf (non-kosher) Jewish restaurant–Shalom Japan and Traif to name a few. These new-school Jewish restaurants are increasingly inclusive of other food traditions, introducing more and more eaters to Jewish food, whether it’s kosher or not.